How did zebras get their stripes? No one knows, except maybe zoologists. But in Star Trek: Discovery, we’ll find out why the Klingons got their forehead ridges, and they actually serve an important biological purpose. 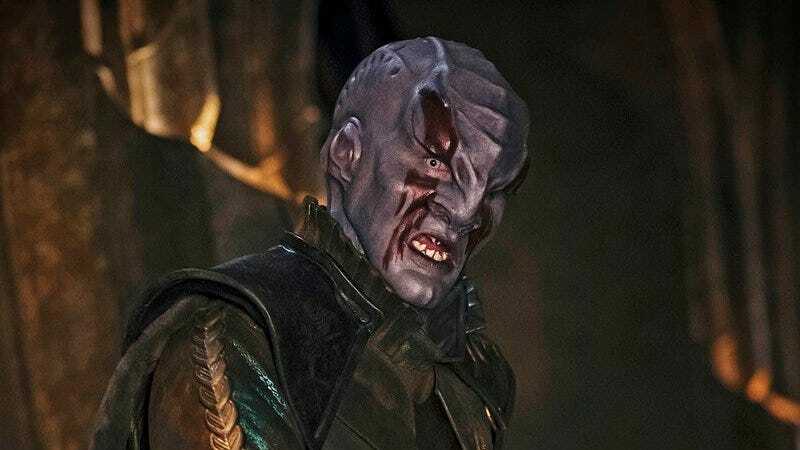 During a panel at the Star Trek Las Vegas convention (as shared by Trek Movie), Discovery creature designers Neville Page and Glenn Hetrick chatted about the show’s version of Klingons, which look remarkably different from earlier versions. Mainly, they’re bald. According to Page, there are two reasons for this: It was a mandate from original showrunner Bryan Fuller, and because they heighten Klingons’ senses. Wait, hold on a second. On the surface, this actually seems like an okay idea. We haven’t really gotten a reason for the forehead ridges (although we do know makeup artist Michael Westmore based them on dinosaur bones) so it doesn’t change or destroy anything we already understand about the show. The bald thing is new, though. It could result in some interesting storylines, especially between the Klingons and Starfleet. Plus, I’ll take any excuse to make Klingons even more badass than they already are. However, it does raise a lot of questions. These Klingons are bald to better access their senses, so is their hair loss genetic or do they shave? Why would some Klingons evolve to have hair and others wouldn’t, and would that affect their abilities? Also, what about the Klingon Augment Virus? Did losing their ridges mean those Klingons lost their extra-sensory abilities, and when they got their ridges back, did they return? And is that virus the reason that they have hair AND ridges later on? Most importantly: Why would anyone pierce their forehead ridges if they contain extra-sensory receptors? That just sounds counter-productive, and really painful. Star Trek: Discovery has had some issues during its production, to say the least, but it’s clear the team isn’t dicking around in regards to Klingons. They’re having the actors speak Klingon with subtitles, working with a dialogue coach and translator to make sure it looks and sounds accurate. And the costumes, props, and creature makeup look interesting...even if some of it doesn’t match what we’ve seen from Klingons in the past. However, Page said that’s entirely on purpose. Star Trek: Discovery debuts September 24, with extra ridges.